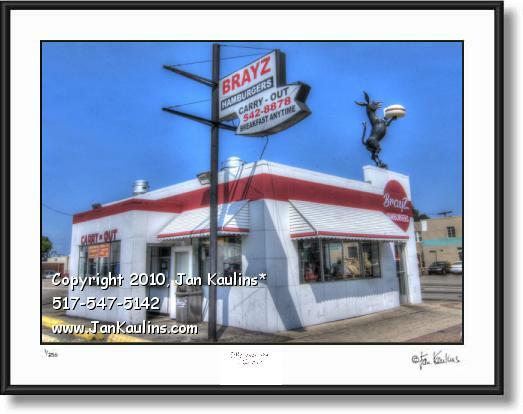 BRAYZ HAMBURGERS Hazel Park photo art print photograph for sale. BRAY'Z HAMBURGERS photograph art prints photo for sale. This is a MULTIPLE EXPOSURE composite photo of a Detroit area neighborhood favorite hamburger joint at 9 Mile and Dequindre in Hazel Park MI. The first Bray's opened in 1950 in Garden City, MI. The owners were Gordon and Roy Bray. Eventually, there were eight stores in total. This Hazel Park Brayz Hamburgers originally went by Bray's name. In the 1970s, the chain was taken over by Gordon Bray's son, Phil Bray, who owned it until the 1980s. After that it was taken over by Gordon Bray's other two sons; Marc (who owned the Hazel Park restaurant) and John (who currently owns the Westland restaurant). The Hazel Park location changed its name to "Bray'z Hamburgers" in the 1990s. The donkey holding a burger and cup on the roof is part of the chain's original design. " This is an original High Dynamic Range (HDR) color photograph created by nationally recognized artist/photographer Jan Kaulins. It is one of the newest artistic images in his most recent series of photographs. Each photograph has been created from nine separate photographic digital exposures and then layered together into one photographic image. It is then ‘tone-mapped’ where individual areas of the photo, as well as contrast, saturation and other qualities of the image can be artistically manipulated to bring out the artistic effects that make these photos so visually unique. Some of the photos in this series are even further enhanced for artistic effect giving them an almost painterly or graphic silkscreened look. They do not look like your grandmothers traditional photos. This is a relatively new photography technique which uses the blending of the nine multiple bracketed exposures to capture and emulate the way that light levels in the real world vary over an enormous tonal range, from the brightest area of sunlight to the darkest area in the shadows. All of these varying degrees of light cannot be exposed properly and captured in a single photograph---hence the necessity of layering and combining of the multiple over and under exposures to allow the viewer to see all of the existing areas of light at one time in one photo. The enhanced saturation, softness, and color of the multiple images also is a partial result of this very unique photographic process and can be quite stunning and dramatic. Sometimes these artistic Jan Kaulins photos seem to almost blur the sense of reality and illusion.